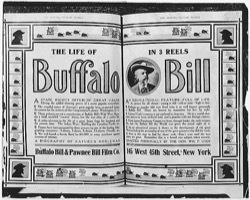 Title: Advertisement for "The Life of Buffalo Bill"
A STATE RIGHTS OFFER OF GREAT VALUE Having the added drawing power of a name popular everywhere. The eventful career of America's greatest popular hero, re-enacted before the camera for the archives of the Congressional Library, Washington, D. C. These pictures are not a reproduction of Buffalo Bill's Wild West Show, nor a lurid, so-called "western" drama, but the true story of a useful life. A series of events in the life of a great Scout from his boyhood until the present time. The Indian Wars; Building the Canadian Pacific, etc. Posters have been prepared for these pictures by one of the leading lithographing companies — 1-sheets, 3-sheets, 8-sheets, 24-sheets, Heralds, etc. We will furnish a Surety Bond for $1,000 to every purchaser against invasion of territory. AN EDUCATIONAL FEATURE — FULL OF LIFE. A picture for all classes — young or old — rich or poor — high or low. 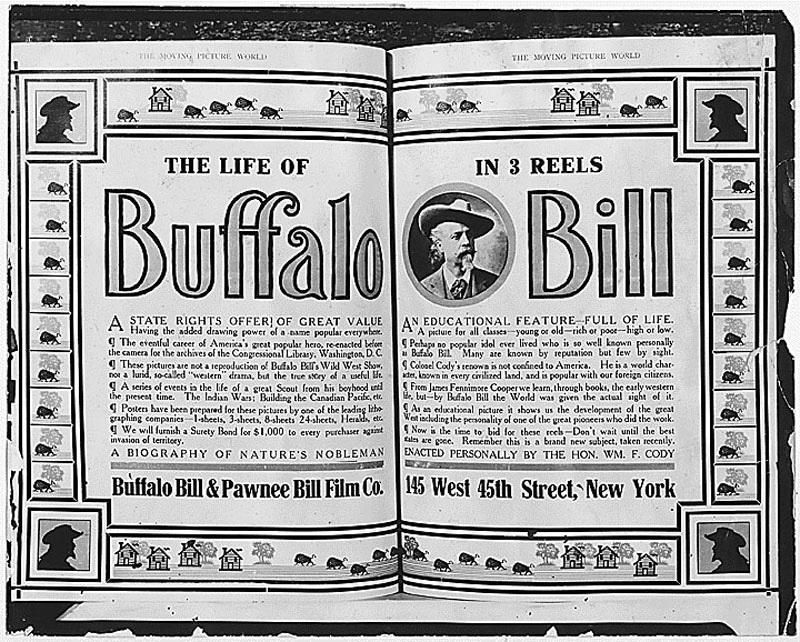 Perhaps no popular idol ever lived who is so well known personally as Buffalo Bill. Many are known by reputation but few by sight. Colonel Cody's renown is not confined to America. He is a world character, known in every civilized land, and is popular with our foreign citizens. From James Fenimore Cooper we learn, through books, the early western life, but — by Buffalo Bill the World was given the actual sight of it. As an educational picture it shows us the development of the great West including the personality of one of the great pioneers who did the work. Now is the time to bid for these reels — Don't wait until the best states are gone. Remember this is a brand new subject, taken recently.